Architects and home designers have also drawn inspiration from the ocean, and most express themselves by designing beautiful beach-front homes that let their residents stand witness to the wonder that is the ocean. 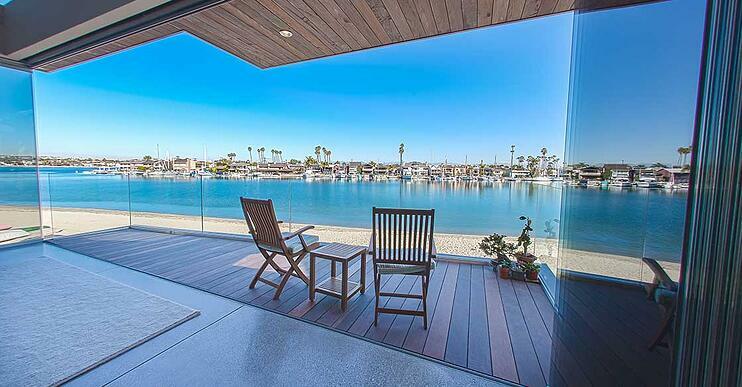 Here are 5 of our favorite luxury waterfront homes that, through the wonder of modern and contemporary architecture, have made the ocean a part of their décor. This gorgeous 3-level home sits on a rocky outcrop on a sea cave, overlooking the ocean. Designed with state-of-the-art 3D technology by architect Mark Abel, each of the 3 levels presents a full-width, 180• view of the whitewater and the Catalina islands. Each of the wide-view levels use frameless sliding doors by Cover Glass USA that slide and stack on one side, flooding the home with natural light throughout the day. The home spans over 3,400 square feet, and has 4 bedrooms and 6 bathrooms, a media room and a glass elevator. This single story house is the result of a renovation and 2,000 square-foot extension of a 3,200 square-foot house in Tiburon, California. 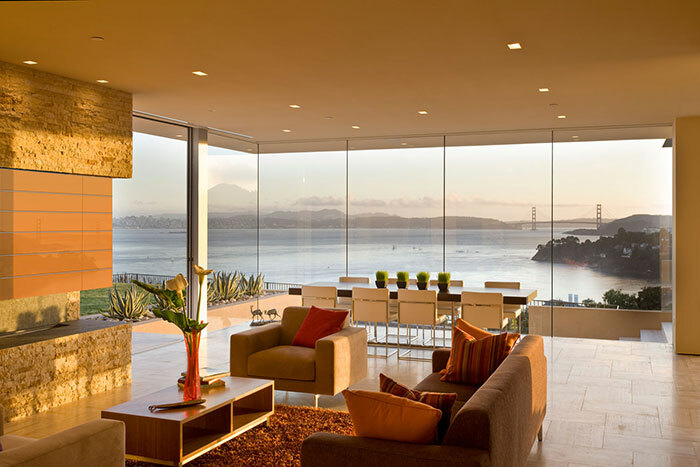 The Garay residence was renovated by Swatt|Miers Architecture, and provides clear, uninterrupted views of San Francisco Bay on the three sides - south, east and west - through frameless, pocketing glass doors and cantilevered roof extensions, blurring the boundary between the exterior and interior spaces of the house. The north end of the house is almost entirely opaque, featuring a “motor court” defined by five stone pillar walls, separated by thin slivers of glass. A low compressed entry way opens into a circulation spine, which overlooks the stunning space with the stunning views described before. This 4,500 square feet villa, which is situated atop a cliff, presents a mural-like view of the Malgrat Islands and the azure, sun-dappled waters of the Mediterranean Sea. The villa extends over 3 levels and has 6 bedrooms and 5 bathrooms. It sports an ultra-modern, white indoor space with an open plan. The white sofas and dining tables are juxtaposed by bright blue dining chairs, mimicking the gorgeous location of the villa. On the other hand, the black, white and chrome kitchen décor presents a sharp contrast to the overall atmosphere. 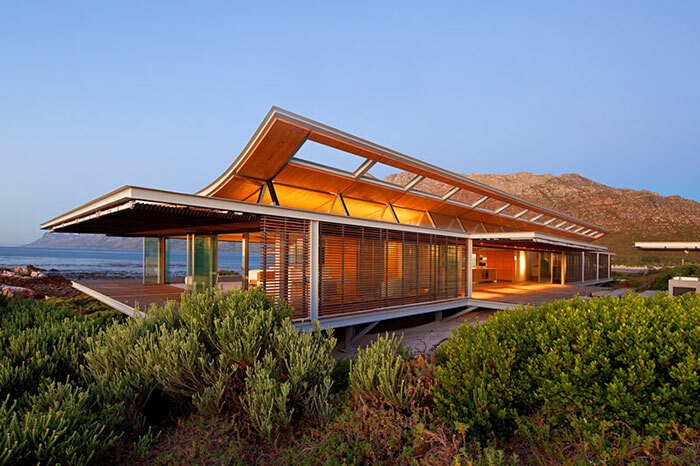 This beach house in Rooiels, Cape Town, designed by Elphick Proome Architects, caught our eye for its brilliant use of frameless sliding glass doors. This is a single-space vacation home that has been conceptualized as a minimalist, glass home with a hardwood roof that offers panoramic views of the surrounding mountains and the ocean on all 4-sides. How? All the external walls are frameless sliding glass doors, fitted with slatted hardwood shutters for privacy. These shutters can be opened hydraulically to become verandahs that provide a nice shady cover around the house. The interior walls, which separate the sleeping and living spaces, can slide away to create a single living space. The elongated pavilion across the length of the house sports a curvilinear roof and uses a mix of contemporary and traditional design of steel and glass with hardwood. Architect Doug Burdge combines functionality and design into a 10,000 square feet modern residence in Malibu. The home’s exteriors wear a contemporary design that belies the practicality and comfort that the home offers. The home offers unobstructed views of the ocean, and pavilions on either ends of the house for privacy. 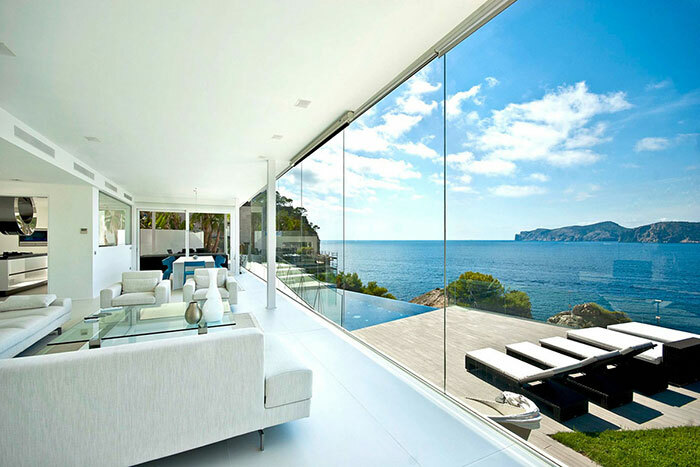 The house maximizes the views of the ocean with ceiling-to-floor sliding doors with hidden tracks. The home has 7 bedrooms and 11 bathrooms, an infinity pool and warm interiors accented by natural light during daytime and soft lighting at night. 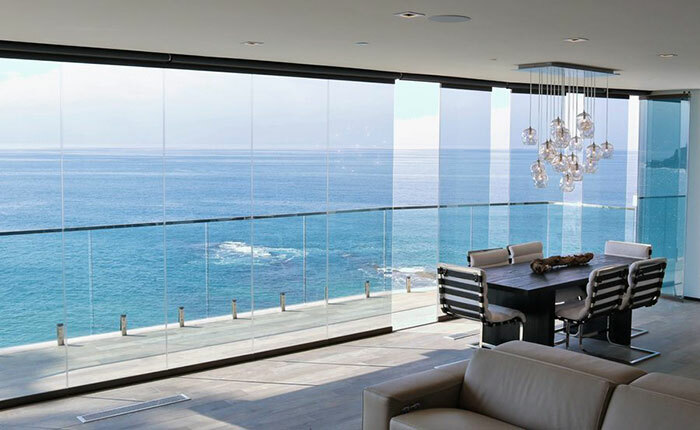 The advances in the use of frameless sliding glass doors has resulted in a plethora of gorgeous homes which take full advantage of their location: placing their owners smack-dab in the middle of the beauty that is Mother Nature. Beach-front houses, in particular, make their owners feel at one with the ocean.